Chukar Culture: It’s a good year for…snakes!! It’s a good year for…snakes!! Last chukar season we encountered only one rattlesnake the entire four months of hunting and that was on a late November day. This year, we’ve already seen three rattlers while out hunting. It seems to be a good year for all types of snakes. More of them slithering across the roads, more flattened road killed ones, and just the other day our neighbor told us she found two rattlesnakes hiding in the tall grass near the children’s sandbox. Yikes! Hells Canyon rattler, a couple weeks ago. Cat doors and snakes won’t stop me! Our dog Angus is a sensitive, cautious little fellow who hates bugs, flies, or anything creeping and crawling. We hope his lack of curiosity in the snake department will steer him clear of rattlesnakes since we didn’t send him to a snake avoidance class. This summer we decided to have our veterinarian give Angus the western diamondback rattlesnake vaccine for dogs, given in two parts: one shot, then a booster shot a couple of weeks later. The vaccine is designed to create an immunity, decrease the severity of a bite, and to buy you time until you can get your dog to the nearest veterinarian clinic to see if additional treatment is needed. Of course every bite is different depending on the size and age of your dog, size of the snake, where it was bitten or how many times, and how much venom is injected. 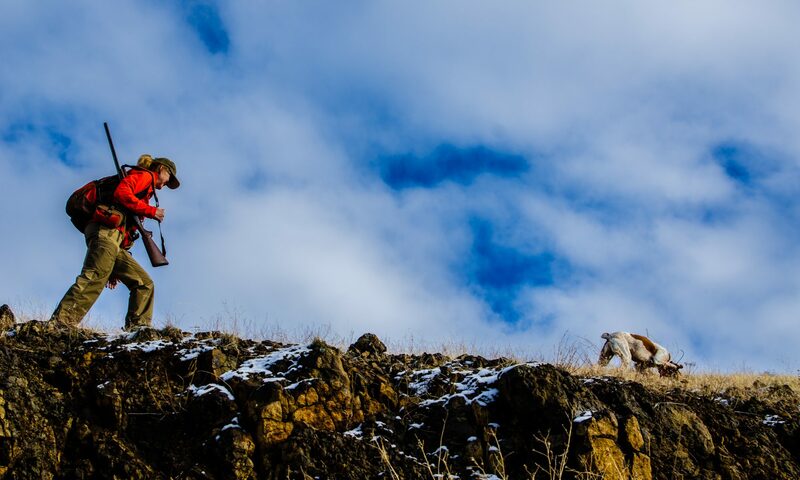 As you know, chukar hunting takes you far from roads and your vehicle. Luckily, most snakes try to avoid your dog and you but it helps to know the basic first-aid in case your dog accidentally gets bitten. We are no experts and you can do your own research but the following seems to be the most common ways to treat your dog. Keep your pet calm and carry if possible. Talk to your own vet about the vaccine and see if it’s right for your dog since some vaccines are not made for all types of venomous snakes. If you’re hunting out-of-state or far from your home territory familiarize yourself where the nearest vet clinic is located and put them on your speed dial. If you are hunting down in Hells Canyon near Brownlee or Oxbow Reservoir, Heartland Animal Hospital in Council, Idaho has an excellent vet. Weiser, Idaho, nearby, also has a vet clinic. As a West coast weeny flatlander I am constantly preoccupied with the possibility of snakes when I head East to hunt. While its good to have your bases covered I have always wondered how helpful snake breaking really is, since it is usually the snake your dog doesn’t smell that gets him… Unless you are my bud’s Draht who took it upon himself to kill and retrieve a huge hognose right next to camp – he was “professionally” snake broke. I think he wanted to see what it took to get three grown men to scream like girls and run backwards as fast as they could in unison. Can’t help to laugh out loud of your description of three men running from a dead snake, thanks for sharing. he doesn’t notice those darn snakes…that could be good or bad? I was out running on the trail the other day and a huge bull snake was crossing it. Angus, in pursuit of some quail in the bushes ahead was totally oblivious of the snake ahead, he came within inches of stepping on it without even knowing it. Had my young Brittany snake trained, sight, sound and scent, The very next week she alerted me to a rattler, keeping her distance and barking loud and fast. Standing on her tip toes. That’s awesome that your dog alerted you to that rattler. I’ve heard that avoidance class does work on a lot of dogs. Thanks for sharing. Jake was trained to snake avoidance and twice I’ve seen him jump like he’d been shocked while hunting. Once it was a snake skin on the trail and I don’t know what it was the second time. That doesn’t help the time he might jump over a rock and be bitten before he can react, but it sure has satisfied his curiosity. I’ve had several skunk encounters this year, but luckily for me, Jake doesn’t care for them either. Jake sounds like a success story. No skunks around here (knock on wood). I just remembered that when Angus was a puppy, he was super curious about something in the bushes while out hiking in the desert. Bob shocked him just in case. We don’t shock him very often, mostly just when he starts acting like a dog and rolls in something dead. That unexpected shock as a puppy might of cured him of being curious about snakes? Next year, I would like to take him to avoidance class. I guess they also teach you about what to do if your dog accidentally gets his foot in a trap which is something we are actually more worried about since wolf trapping is allowed in areas we often hunt. Man I hate snakes…last year my dogs an I were hunting a canyon in the mountains in southern Nevada, when my dog started growling an charging to me. Then I herd the hssss an looked down at my feet an there was a rattler right between my stupid feet…screamed like a little girl an jumped off the boulder I was standing on…had to listen to that thing rattle the rest of the way down the hill. Love the forum been following it for awhile keep it up! Yes, seeing one snake reminds you that they’re out there and the rest of the day you keep obsessing about running into another. That rattler in the photo above that I took was just sitting there curled up silently. We’d had just stopped hiking to catch our breath and to look for Angus when Bob looked down next to his feet and there it was with no warning. He didn’t scream but he sure can move fast…usually leaving me in his dust. We left that snake in peace so it could enjoy the rest of it’s day.